I assumed that while I’d been at work, she’d had a major epiphany about poetry, and was now passing on this crucial news. I’d discovered poetry at boarding school after finding Leonard Cohen’s Selected Poems and Richard Brautigan’s Rommel Drives on Deep Into Egypt. I stole those books and after leaving school took them with me to Yanco Station, in the Riverina, where I worked for a year or so as a jackaroo. It was here that I began writing poetry, inspired by Cohen’s romanticism and Brautigan’s surreal world view. I had no idea what I was doing, and the poems were terrible. If I’d known just how bad they really were, I might have given up, but the drive to write was far more important than any self-assessment. Returning to live at home, I wrote constantly. My father gave me a portable Olivetti typewriter. After a few months, out of a sense of desperation, my mother went through the Sydney telephone directory, looking for anything to do with poetry. She found Poetry Society of Australia and dialed the number. When a man answered, she said “I’m worried about my son. I think he might be a poet, can you help him?” The man gave her a list of things her troubled son should know. He also suggested I come and see him, and gave mum the address. The next day I went looking for poetry. I caught the train into the city and spent all day looking in second hand bookshops. I found two that would travel with me all that year and beyond. These first edition, hardbound books would quickly change my ideas on how poems could be written, and would prove to be a major source of inspiration. One was Canticles on the Skin, the other Swamp Riddles. Canticles on the Skin amazed me with its poems about prison, drugs and city life, and how these details were aligned so effortlessly with poems about, and inspired by, the Hawkesbury River. Yet it was Swamp Riddles that captivated me, and challenged my perceptions of how a poem can be crafted from experience and a wild imagination. I knew nothing of line-breaks, and very little of stanza form. The idea of taking risks with language and ideas hadn’t really occurred to me. Cohen and Brautigan had set the scene. The lyric had been a serious part of my study, although in my hands it too often led to sentimentality and predictable rhyme. Now I was entering territory that, while unsettling and confusing, also forced me to reconsider my ideas on how to shape and transform experience. No title. No punctuation. A poem whose lines both conformed to and rebelled against everything I’d come to expect. Why would Adamson not break the third line after “pass” and the fourth line on “4am”? The poem works as both a very fine love poem and a great example of enigmatic understatement. I felt driven to find out why he’d not gone for the clear option, but the more I read the less I understood. This was a fierce education. Swamp Riddles indeed. There is a disarming immediacy to the first few poems in Swamp Riddles. The subject matter is not itself confronting, yet the way Adamson has deliberately played the lines out against anticipation forces us to reconsider what’s happening in the margins as well as what’s in full view. There is a confluence of ‘real-time’ and what appear to be stills cut from memory, skillfully placed to make an odd, demanding music. “Sibyl,” “The Dunes,” “Completely Happy” and “Mondrian: Light Breaks Upon the Grail” work as curious, luminous links between the intensely personal, questioning poems that open the first section, and the final (untitled) poems that conclude it. The absence of punctuation means that we must negotiate the poems in terms of their line-breaks and rhythm, and trust in our intuition to lead the way. It’s in these poems that Adamson’s imagery takes flight: “they thread their red pebbles / and do not require / shadows” (“The Dunes”); “fish knife flickers in the sunlight” and “Sun dries fishblood up my arms on / my shirt and the intricate fishing tackle” (“Mondrian: Light Breaks Upon the Grail”); “Campaigns rose from reflected stars,” and “And on the jetty / my catch, white as the planets and shining there / as inconstant as prayer” ([Untitled] p14). 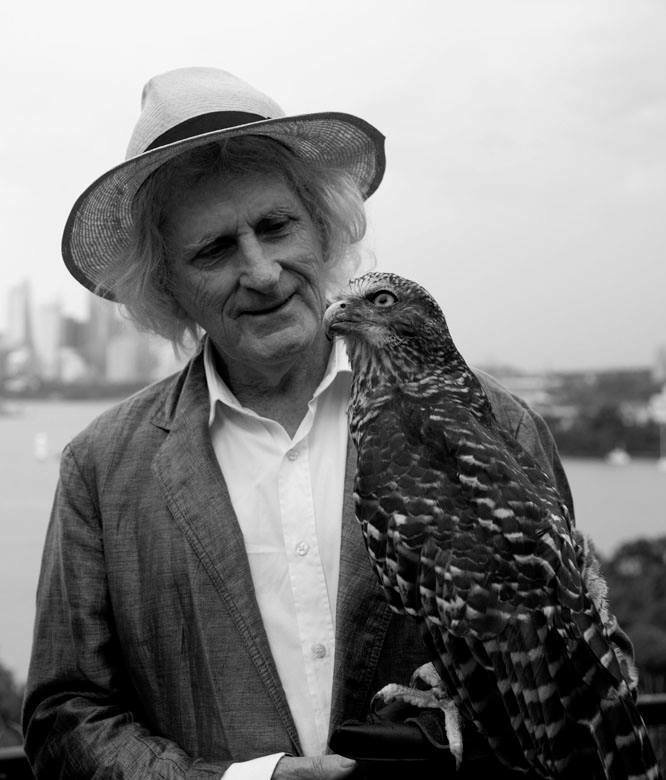 Photo of Robert Adamson with Powerful Owl by Juno Gemes. This is one of two poems that employs the abba rhyme scheme to great effect. It is also (after a fleeting mention of them in the previous poem: “flying birds / down through the valley in brief gusts” the first time in the book that birds are given prominence. As future books would reveal, birds appear as images that are salient to the metaphorical or metaphysical content of the poem. Rarely does their appearance rest exclusively on their description. So when he writes “My whole life seems curbed with these demands / for order” he is aware of the contradictory nature of the conflicted man giving over to intense observation while trying to define a species, and the need for control and order within the shaping of the poem’s formal style. Something as tactile and raw as “animals bumping rocks” leads to “their search / for watercourses that tumble to sea” and then we are shocked away from the scrub and the animals into something that could be (and why not?) some kind of alien interruption to the flora and fauna: “a chemical glow / beam from caves”. These lines are from the elegy (For Michael Dransfield). It is, (with “Sonnets to be Written From Prison,” one of the book’s most personal, intimate, immediately accessible poems, and reveals Adamson’s ability to engage emotionally, and courageously, with difficult subject-matter. An extended version of this essay is forthcoming in the monograph Fin, Feather, Sky, River: the Poetry of Robert Adamson.